Who's that funky monkey? Guess what! We have a stunning surprise. Because of all the monkeys in the world, you've stumbled across the most special one of them all. And you didn't find it in the jungle, or even in the zoo. This monkey is right in your own home. Because it's your kiddo! This fun monkey costume comes styled as a furry tunic. The hood had piece goes over his own head and it features the light. It features sculpted monkey features, along with even a tuft of hair on the head! It also comes with coordinating boot covers. Soft polyester faux fur gives it a comfy feel and fun appearance. In sizes for 18/24 months, toddler, and size 4/6, we're sure to have a fit just right for your kiddo. This toddler monkey costume is part plush, and totally adorable. 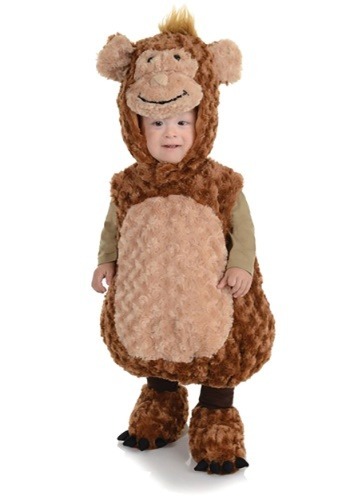 Deck out your tiny tot in this loveable costume, and we'll all enjoy the monkey business fun! Whether for a costume party, for Halloween, for dress-up day, or just because you feel like giving a funky monkey a hug, get them this toddler monkey costume and you'll have done good.